Why is sudoku so popular? The word phenomenon is arguably over-used, but it certainly does apply when talking about sudoku. For many years, the puzzle world was dominated by word puzzles such as the crossword and word search puzzle. Then suddenly in 2004 and early 2005, sudoku hit the newspapers in the UK, first being published in the Times, and soon took the country by storm, with newspapers following suit and many other publications also clamouring to procure sudoku for their publication. The first few sudoku books on the market sold in huge quantities, and now that the sudoku market is mature several years on, the puzzle is still extremely popular and a mainstay of the puzzle page in the vast majority of newspapers and magazines. So what is it that made this puzzle so popular compared to other non-word puzzles that have tried and failed in the past? Well, the fact that it doesn't require any mathematical ability is probably important given maths puts a lot of people off (whilst of course there are those that love it too!). The simplicity of the puzzle and the fact the rules can be understood in a few seconds is also important: simply enter the numbers 1 - 9 once in each row, column and box. Some have suggested that the fact that the puzzle starts partially solved tempts people into wanting to fill in the grid. This may be true to some extent but as there are many puzzles that start like this that aren't a smash hit that must only be a small part of the appeal. So, the puzzle is easy to understand with few rules. And no maths or word skills are required to solve it. Is that all there is to it? Another factor that has help it spread so rapidly is that it is fairly easy to create a sudoku, and so there is enough supply of the puzzle at a reasonable cost to meet the demand. Some lovely logic puzzles are tortuous to create and therefore if the demand ramped up supply would be hard to keep on top of without seriously diluting quality. Also there are various simple strategies that can be employed to solve the majority of sudokus, whilst there are harder to spot rules and patterns that can be used to solve harder puzzles. The above means that the puzzle has good depth, and this means there is fun to be had in solving many puzzles and discovering new solving rules for yourself, or perhaps looking for opportunities to implement other rules you have read about elsewhere. Although the majority of sudoku solvers won't know about X-wings and swordfish, these techniques and plenty more are studied and practiced regularly by some real sudoku aficionados. Thus the fact the puzzle can be great fun for a beginner solving their first puzzle and also someone who is something of an expert helps to explain the continuing appeal of the puzzle. And, yes, sudoku filled a gap in the market, and was the right puzzle to do so. Many subsequent puzzles have been billed as the 'next sudoku' and whilst nothing has quite lived up to that billing yet in terms of success, it is interesting to wonder if any of those other puzzles would have had that level of success had they happened to come before sudoku. We will never know. 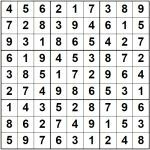 Why do you enjoy sudoku, or think it is such a successful puzzle? Do please comment below! I love sudoku,its the best.it is popular because it is fun.it relieves stresses and improves our brain.it has only positive good effects. I have a theory that when we do logical problems our brains can't at the same time focus on emotional stresses, so we really can relax while doing a sudoku.